"Linda Susan Adams DeLong, Westbrook College, Class of 1977"
Westbrook College student Linda Susan Adams DeLong, Class of 1977, was a Nursing major and lived in Hersey Hall. 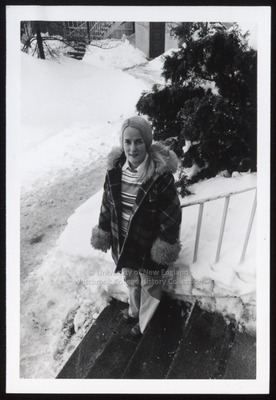 For her senior class candid photo, which appeared in the 1977 Tower Yearbook, she wore wide-bottom jeans, a striped crew-neck sweater with a white collar beneath, and a plaid jacket with fur hood and cuffs. Her hair was long, parted slightly off-center, and pulled into a pony tail at the nape of her neck. Linda Susan stood on the bottom steps of one of the residence halls, surrounded by snow.